Keywords: Sustainable transport indicators; Equity; South Africa; Story-telling; Case study. this case study for other cities? sustainable transport concepts that were debated and later adopted by the City of Cape Town. indicators that appear to have stuck in Cape Town. meetings, papers, tensions, alliances, negotiations and advocacy. What matters in all of this? presentation of the case, some reflection on broader questions is also included. (Wachs, 1985; Forester, 1993; Watson, 2002; Sandercock, 2003; Flyvbjerg, 2004). 2.1. What is meant by “environment” and “sustainable”? bio-physical aspects to a more all-encompassing one. something more all-encompassing within a sustainability concept. 2.2. What is meant by “transport”? as the needs of the poor and middle-classes rose up the political agenda. frameworks requiring Integrated Transport Plans). Mbeki’s second term reflected some frustration with lack of change on the ground. 2.3. What is meant by sustainable transport? by cars is particularly space inefficient (Tolley and Turton, 1995). is far less familiar territory. dominated by a discourse of basic service delivery and economic growth. issues of inequity and poverty? parallel needs for addressing inequities, poverty alleviation and improved sustainability. thinking for the project around sustainable livelihoods and transport. spatial configuration of the City is problematic (SEA, 2006). nexus for the South is sparse. between policy and household decisions (Institute of Development Studies, 2009). Relevant Worldwide Activity and Development of an Initial Long List of [sustainability] Indicators”. The list contained more than 150 indicators. seemed to indicate a need for guidelines for integrated sustainable transport planning. between the members of the project team and the US consultants on the project. components (see Appendix for a presentation of the complete checklist). the intervention, comprising natural, physical, human, social, financial capitals and time.  Part 4: a summary of the whole checklist. sustainable development. This ISTC was not field tested due to insufficient project time. followed unless they were regulated, legalized or better promoted. the debates about transport policy and planning focused on sustainability. reproduced without edits in Table 1. Source: City of Cape Town (2006), p. 27.
the meeting was to review and refine these Sustainable Transport Indicators. business areas, at peak times and with a vehicular rather than person lens (Behrens, 2004). indicator set was adjusted accordingly, to reflect the reality of data availability. informal linkage with the City staff. computer programme, and for use as strategic indicators, are shown in Table 2. Table 2: “Key performance indicator summary” adopted in 2009. Source: City of Cape Town (2009), p. 21.
representatives. In this section the rationale for each indicator is outlined and discussed. to decision-makers justified the separate inclusion of this indicator in the set. City has attended to in recent years, with some success reported. likely “wins” for sustainability: with the middle classes. and to co-develop a suitable measure for inclusion in the ITP. dataset, struggling to represent a highly complex, disaggregated and rapidly changing context. to straddle boundaries, sectors and scales in this way. questions primarily about job creation and poverty alleviation through basic service delivery. text books, which suggest that the transport planning process is neat, linear and progressive. attention to detailed data, which resource constrained local government cannot readily afford. “whose sustainability are we pursuing?” unanswered. of earlier drafts, plus the two anonymous reviewers who provided valuable critical comments. Protection Agency. Cape Town: University of Cape Town. University of Cape Town. Cape Town: University of Cape Town. in South Africa. Transport Reviews 24(3): 317–336. networks: evidence and implications. Development Southern Africa 21(4). Guidelines for Review Procedure. Table F1. South Africa: Booz-Allen and Hamilton. progress and pitfalls. International Journal of Sustainable Transportation 2:138–157. Carney, D., Drinkwater, M., Rusinow, T., Neefjes, K., Wanmali, S. and Singh, N. 1999. UK. DfID, CARE, Oxfam and the UNDP. London: Department for International Development. http://www.centreforsustainabletransportation.org/ [22 February 2010] City of Cape Town 2006. Integrated Transport Plan for the City of Cape Town: 2006 – 2011. City of Cape Town 2009. Integrated Transport Plan for the City of Cape Town: 2006–2011. Review and update October 2009. Cape Town: City of Cape Town. Management Policy. Pretoria: Government Printer. Flyvbjerg, B. 2004. Phronetic planning research: theoretical and methodological reflections. Planning Theory and Practice 5 (3): 283–306. argumentative turn in policy analysis and planning practice: towards a critical pragmatism). black commuters. Pretoria: South Africa Annual Transport Conference. Grieco, M. and Turner, J. 1997. Gender, poverty and transport: A call for policy attention. HABITAT), ‘Governance and participation: practical approaches to poverty reduction. Towards cities for the new generation.’ Florence, November , 1997. Hardi, P. and Zdan, T. 1997. Assessing sustainable development: principles in practice. Winnipeg: International Institute for Sustainable Development. Tran:SIT model. Pretoria: South African Transport Conference. Definitions, indicators and metrics. Journal of Infrastructure Systems, 11(10): 31–50. Contextual Nature of Science. Oxford: Pergamon Press. Consulting and US Environmental Protection Agency. Cape Town: University of Cape Town. (KPI’s) as a measurement of sustainable transport – are we measuring the right things? 22nd South African Transport Conference. Pretoria: South African Transport Conference. Law, J. 2000. Notes on the Theory of the Actor-network: Ordering, Strategy and Heterogeneity. transport policy. Transport Policy, 2(1):43–49. Pearce, D.W. and Nash, C. 1981. The social appraisal of projects: a text in cost–benefit analysis. Africa. Development Update, 5(1): 81–104. Ringwood, W.B.A. and Mare, H.A 1992. Prioritisation in the Urban Transport Planning Process. 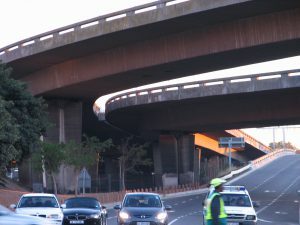 South African Roads Board Project Report PR 91/415. South African Roads Board. Planning Theory and Practice. 4 (1): 11–28. regeneration in South Africa. Urban Design International, 8: 119–133. Baseline. Cape Town: Sustainable Energy Africa. Swilling, M. 2006. Sustainability and infrastructure planning in South Africa: a Cape Town case. Environment and Urbanization 18 (1): 23–50. Division, Proceedings of the American Society of Civil Engineers October, Paper 1076 : 1-7.
approach. Harlow: Longman Scientific and Technical. Pollution and Traffic Accidents as Policy Priorities. Habitat International 21(1): 79–89. Wachs, M. 1985. Planning, organization and decision-making: A research agenda. Transportation Research A 19A (5/6): 521–531. movement to planning theory. Journal of Planning Education and Research 22(2): 178–187. Weiner, E. 1999. Urban transportation planning in the United States: an historical overview. World Commission on Environment and Development (WCED) 1987. Our Common Future. International Co-operation: Environment August 2, 1987. Table A1. Sustainable transport checklist.  The level of intervention of the proposed policy/plan/project and size of the affected area/s.  Social and economic characteristics of the affected area/s, including political, institutional, religious and cultural characteristics.  Current land-uses (formal and informal) and economic (formal and informal) activities in the affected area/s.  Current location of community facilities, such as schools, hospitals, police stations, clinics, libraries, community halls, churches and crèches in the affected area/s.  Current operating hours and costs associated with public transport modes.  Current transport user groups and their needs, with specific reference to vulnerable groups such as women, children, elderly and the disabled in the affected area/s.  Current economic development needs in the affected area/s.  Vulnerable social and economic groups in the affected area/s and their economic development and transport needs?  Existing/proposed transport, land-use planning and economic development policies, plans and initiatives for the affected area/s?  Predicted future transport and economic development needs in the affected area/s.  Transport alternatives, including infrastructure, location and modal alternatives in the affected area/s.  The need to uphold the constitutional right of individuals and the public to administrative action that is lawful, reasonable and procedurally fair.  The need to foster transparency in public administration by providing the public with timely, accessible and accurate information.  The need to promote accountable public administration.  The need to ensure the provision of information to those affected by the laws, procedures & administrative practice relating to land development.  The need to enable public access to information and ‘records’.  The need to promote open and transparent decision making.  The need to provide adequate written reasons for decisions taken.  The need to promote procedural fairness in administrative decision-making that affects individuals as well as the public.  The need to ensure that administrative action is based on ‘adequate’ reasons.  The need to ensure that issues considered in the decision-making process and the manner in which they are considered can be explained and justified.  The need to give effect to the principle of co-operative governance.  The need to undertake ‘development-orientated’ planning.  Promoting integrated land use planning and development in rural and urban areas in support of one another. Strategic Framework; Provincial Land Transport Framework; Current public transport records; Public Transport Plans and Integrated Transport Plans.  The need to ensure the integration of the different modes of land transport. transport planning and environmental governance.  The need to inform the public and respond to (basic) public needs.  The need to encourage, and create conditions for, the involvement of the local community in local governance matters.  The need to ensure that local authorities have consulted with the local community regarding municipal services to be provided. Induced traffic, which in turn could overall increase levels of air pollutants? Mode shift to public transport or non-motorized modes, which could lead to overall reductions in pollutants? Promoting or reducing access to public transport and walking/ cycle routes to school etc. Promote or impact on other resources?